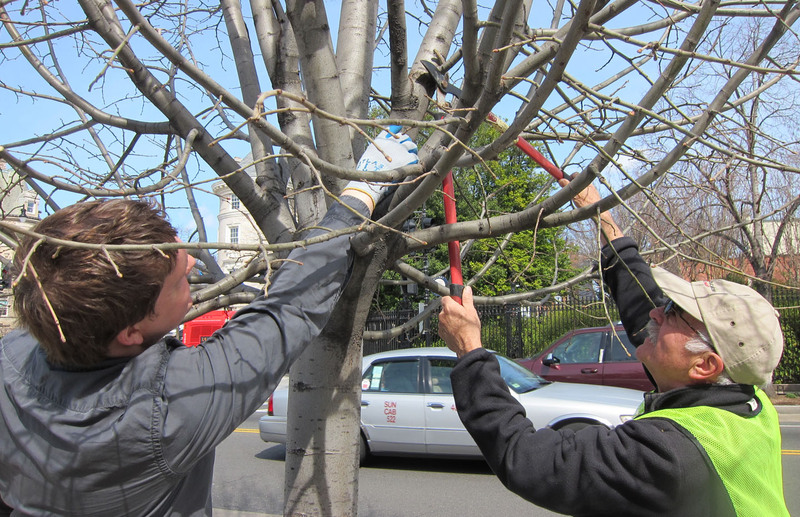 Today professional arborists with the DC Urban Forestry Administration (UFA) led an outdoor workshop demonstrating UFA's approach to pruning city trees with Restore Mass Ave volunteers. Top: Jacqui and Earl. Below: Marty takes a try. Tree by tree, UFA arborist Earl Eutsler showed the class that the lines of zelkovas on 23 Street that frame the famous Turkey Residence and Romania Embassy can grow as they are, except for some crossing limbs. With the lindens in the 2200 block of Mass, we were shown tree by tree how to look up into the bare branches to see problematic ones. Keith Pitchford of Pitchford Trees also advised. Reaching and cutting a limb in the right spot is tricky! 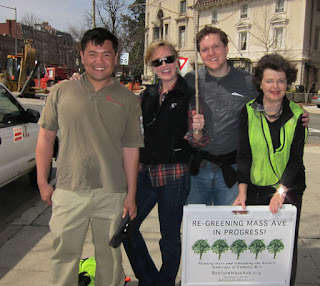 For more photos (and perky comments) see the Restore Mass Ave Flickr page. Add your comment! Note: It is illegal to cut branches of city trees. Do not try this without UFA on hand giving the go-ahead. The UFA WANTS neighbors and volunteers to weed and mulch city sidewalk trees. But as to cutting branches, NO WAY! For details see the 2002 Urban Forest Preservation Act and Public Space Management rules of DC Department of Transportation. Public forestry in the nation's capital is underfunded. The UFA's 16 professional arborists have made great progress; UFA now manages 148,000 street trees, up from 140,000; also more are healthy. But some professional arborists say that most sidewalk trees grow better if they are selectively pruned at some point in their lives. 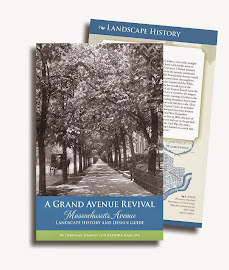 So we're interested in when and how the now-young and mid-sized trees of Embassy Row can be shaped the most healthy and elegant forms of growth. 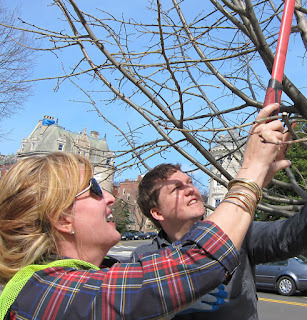 Why shouldn't Washington have a volunteer pruner corps, trained and licensed, so volunteers from here, Capitol Hill, Petworth, and Casey Trees can extend the pruning help that city trees need? 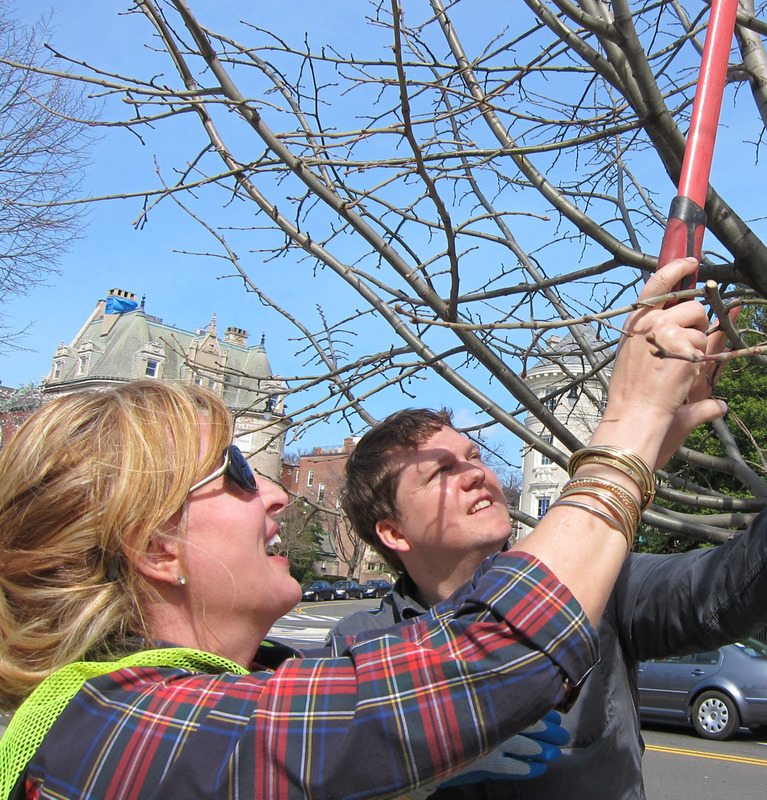 One model: Tree Stewards of Arlington and Alexandria, which offers classes and licensing. 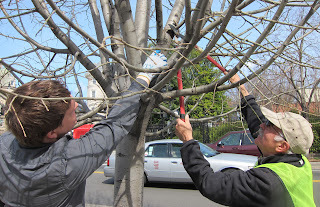 Here's a great video of its January outdoor pruning class. Class dismissed: Left to right: Simoun Banua (UFA), Jacqui Michel (RMA), Earl Eutsler (UFA), Deborah Shapley (RMA).